You can also watch part 1 of the meeting here. 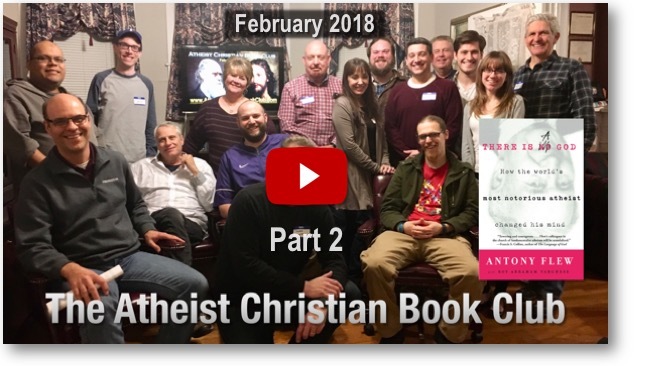 What happened at this month’s Atheist & Christian Book Club? By popular demand, you can now watch our Feb. 2018 meeting. You’d think this is a recipe for a riot! Put 25 Christians and atheist in the same room talking about God and and brace for the explosion. Yes, it can get tense at times but both sides are remarkably respectful and even friendly. Watch and see! Want to take a look at the actual meeting? Here is part 2 of this month’s book club discussing the book, There Is a God, by Dr. Antony Flew. If you missed the first part, you can watch it here. Dr. Flew was one of the 20th century’s most ardent academic atheists who debated some of Christianity’s top scholars including CS Lewis, William Lane Craig, and Gary Habermas. But in 2004, Flew shocked both Christians and atheists worldwide when he announced that he was now convinced that there is a God. Why did he change his mind? Watch the conclusion of our book club discussion and let me know what you think. Our Atheist & Christian Book Club is just of the many ministries and outreaches of Watchman Fellowship. I greatly appreciate your prayers as we try to reach atheists and other non-believers with the truth of the gospel of Jesus Christ. Please consider a tax-deductible gift in February to help us reach those of other faiths, religions, and different worldviews with the gospel of Jesus Christ.